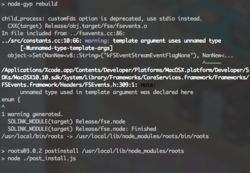 do you have npm installed? @jenius Roots is great, and I'm excited to try using it with Contentful. Just wondering if you'd looked at Prismic.io when selecting a CMS, and if so why you chose Contentful over it? maybe it's because i use NVM to manage my node versions? hmmm, not sure. still can't get a new project to start. aaaand still failed. man, not sure what's going on here. i've had a few of the older builds of roots on this machine, maybe i need to go sweep them up? @permadesign I'm interested in the same evaluation of options for best CMS w/ api support & easy structured data. Wish Craft CMS had better API support out of the box. Roots doesn't care what CMS you use - you can use whichever works best for you. According to the internet discussion I have the impression Contentful is more client friendly than Prismic.io. @jenius I have a related question -- do you know of a good example of a site with JSON API content? Like what you show in the Hybrid Static and APIs video? May have missed it but don't think any of the sites in http://roots.cx/articles/built-with-roots show demonstrate the API. The Mojotech "source" link is broken - would love to see that because also interested in how to implement the entire site's content loaded up front like they have. Any tips? @eholzwarth did you happen to look at the video @samccone had made for MojoTech? 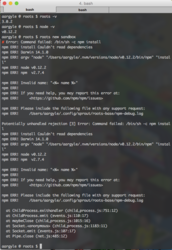 @jhliberty does my issue look like a cli issue or an issue with my machine? 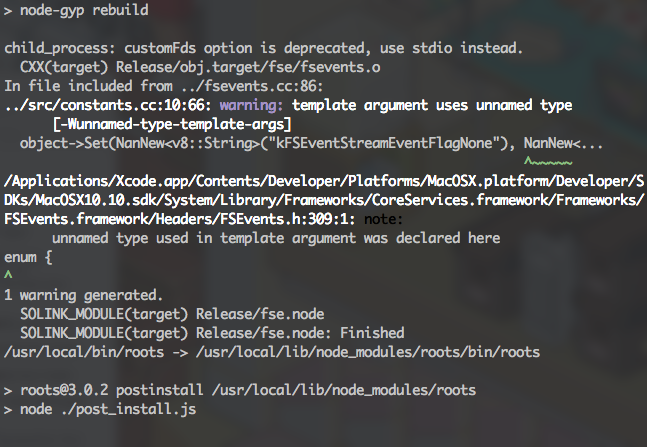 it looks like this command is the problem argv "node" "/Users/aargyle/.nvm/versions/node/v0.12.2/bin/npm" "install". 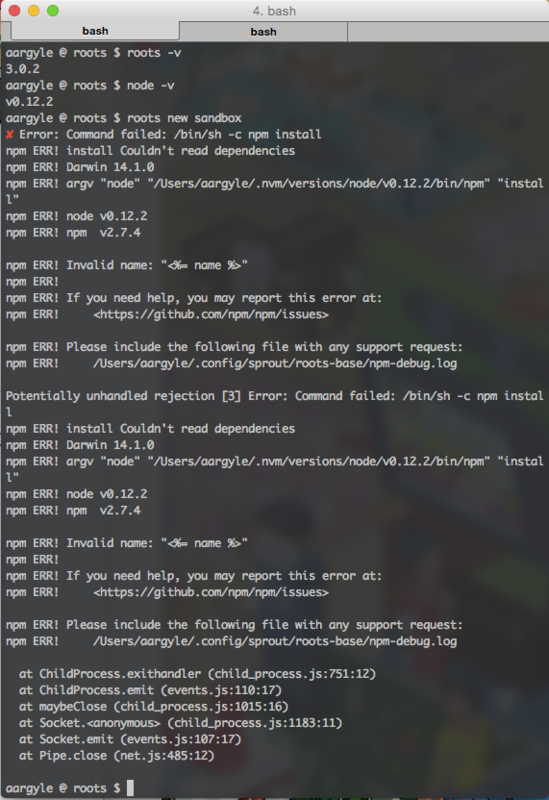 Either that or npm really does have an issue with the package.json file and is blocking the reading of deps... i'm so sad! that expected installation console output?